During the spring of last year (April 2014) I was coming home from a work engagement in West Ulster. The early evening was bright, the skies were blue, the weather was just lovely – hardly a breath of wind in the air. I was contemplating that the next town on my drive would be Dungiven. It then struck me that in all my time as a professional archaeologist, I’d never stopped to see Dungiven Priory. At one time my work would frequently take me out this direction, but I was always in too much of a rush to get there in the morning, or get home at night, to stop. Confirming in my head that I didn’t need to be back at any specific time, I took the turning onto Priory Lane (map). After only a short distance Priory Lane stops being a lane and becomes instead a rather overgrown farmer’s track. There didn’t seem to be much space for parking here, so, with growing trepidation, I carried on down the track. It’s not a particularly well cared for stretch of road and has grass growing up the centre, and briars gently tapping off the wing mirrors as I went along. Thankfully, there was a very small parking area at the end – sufficient to turn only one car, but it was enough! I’m just including this as a word of warning if you visit the place yourself and are, like me, not particularly adept terrible at reversing along narrow lanes! There is believed to have been an Early Christian monastery on this site, high above the river Roe, associated with St Nechtán (d. 679). However, even if true, no trace of this survives today. 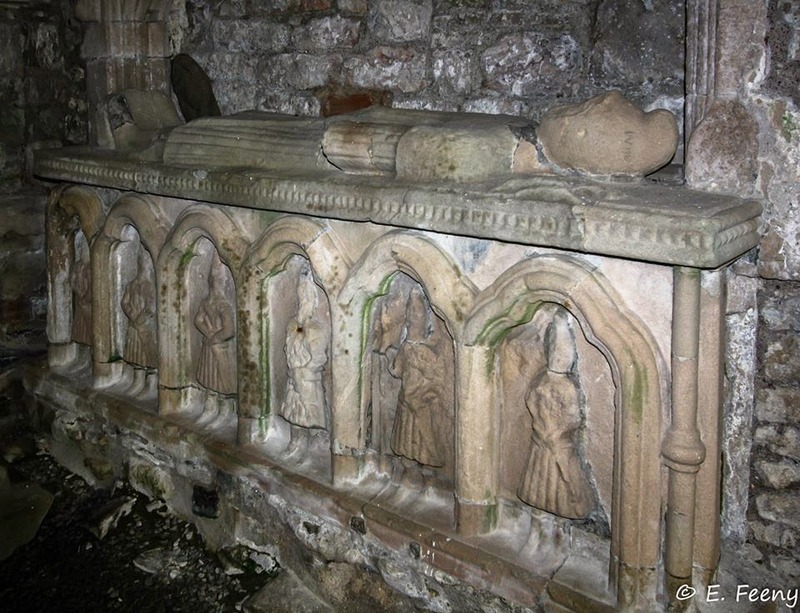 The earliest visible remains today are associated with the 12th century priory of Augustinian Canons. Of the standing structures, the nave is the oldest, dating to the early- to mid-12th century. 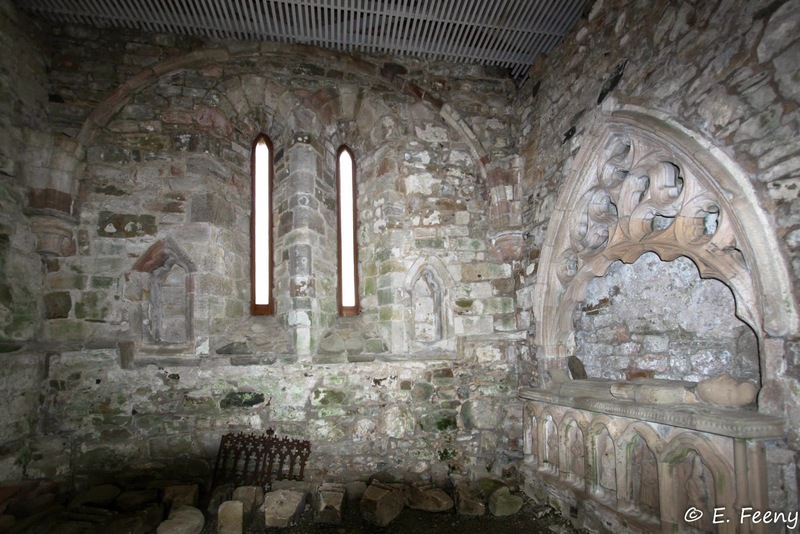 The chancel is slightly later, dating to the 13th century. 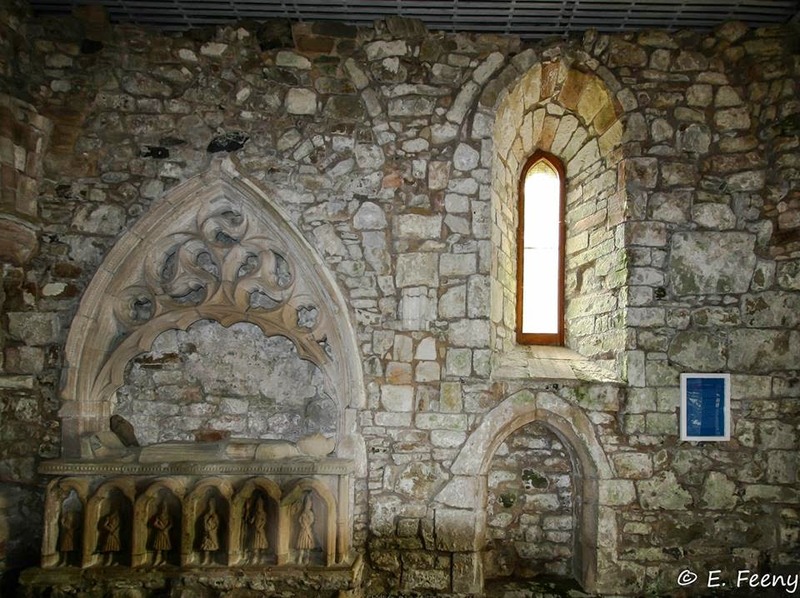 In the period after the Dissolution of the Monasteries, the site – long associated with the ruling O’Cahan/Ó Catháin clan – was reused as one of their castles. This was probably in the tower constructed at the western end of the church, which collapsed in 1784. In 1602 the site was garrisoned by Elizabethan forces and by 1611, following the conclusion of the Nine Years’ War, the lands and buildings passed to Sir Edward Doddington, who created a house and bawn on the site. This appears to have become derelict and burnt down by the end of the 17th century. By the 20th century little evidence of the house survived above ground, though excavations in the 1980s revealed some of the foundations. 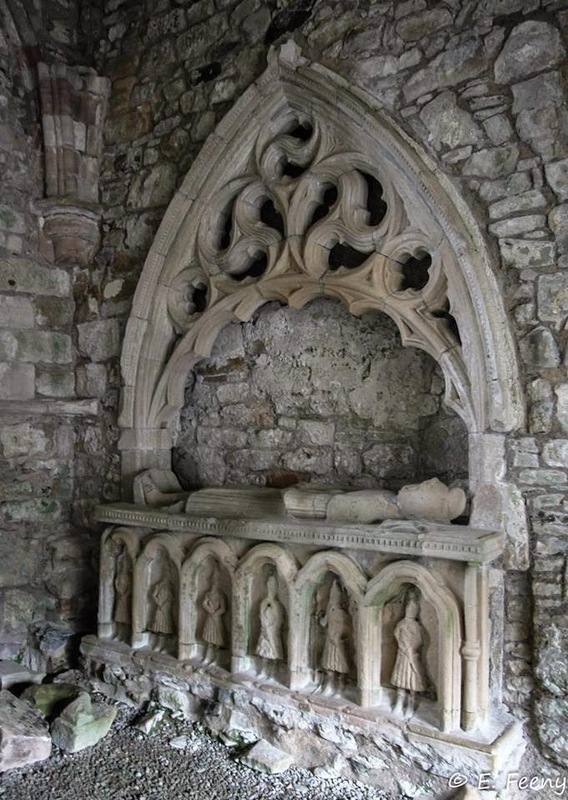 By far the finest piece on the site is the tomb, reputedly, of Cooey-na-gall (‘Terror of the Foreigners’), the local O'Cahan Chief, who died in 1385. 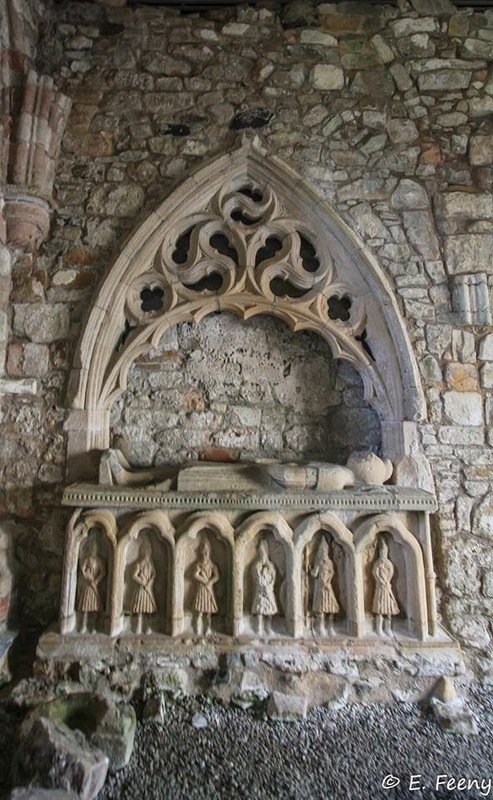 The tomb is built against the south wall of the chancel and shows a figure in effigy below an open work tracery based on five roundels within a gothic, pointed arch. The bench on which he lies is decorated with six arched niches, each with a figure thought to represent a Scottish Gallowglass mercenary. 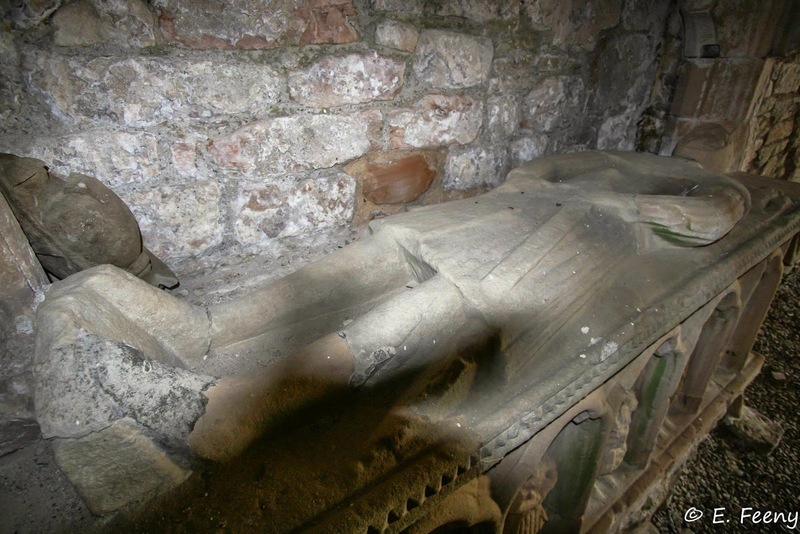 However, it is also argued that the style of the tomb is of the late 15th century and is likely to be the work of a western Scottish sculptor. 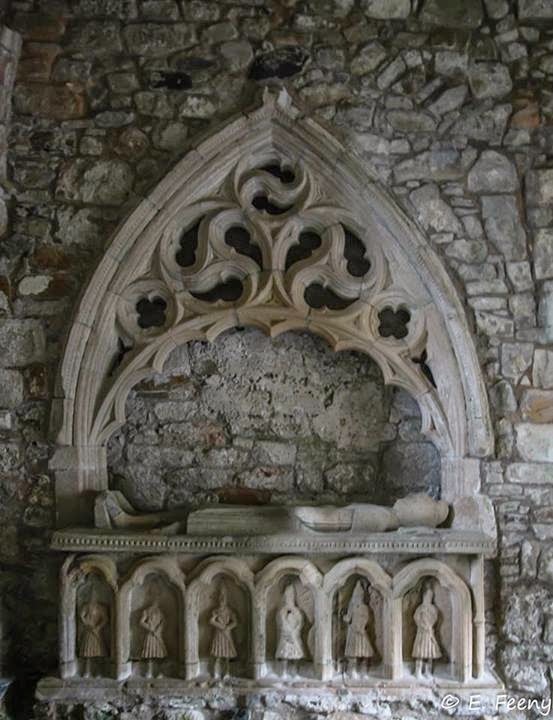 In this case, the tomb may belong to a later Chief, Aibhne O'Cahan, who was murdered in 1492. 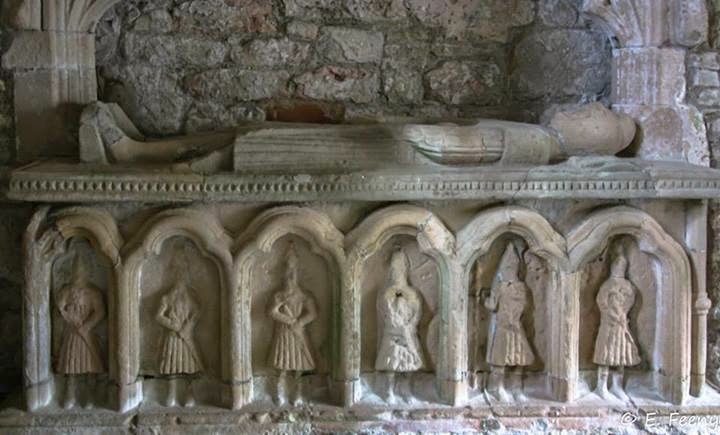 Whoever the tomb was commissioned for (and I make no pretense at being an expert in this form of monument or historical period), it is considered by many to be the very best example from this period in west Ulster – a true masterpiece. 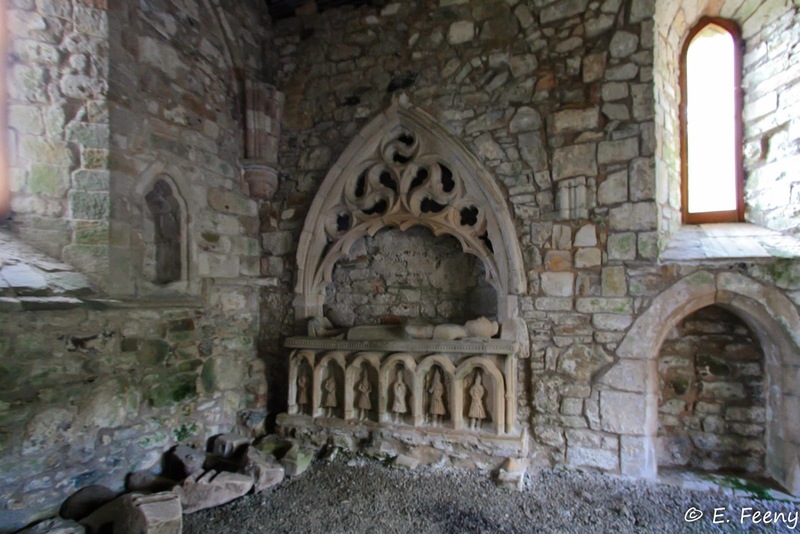 What I did not know, as I made my way towards the Priory was that to provide security and shelter for this tomb, the chancel has been reroofed and is not open to visitors without a key. For this reason, my photographs – taken through the bars of the grille – were less than adequate (the best of them is below). As luck would have it, a few days later I was talking to a Facebook friend, Mr Ed Feeny. He said that he was planning to visit Northern Ireland later in the year and wanted to know if there was anything off the beaten track in that part of Ulster that was worth exploring. 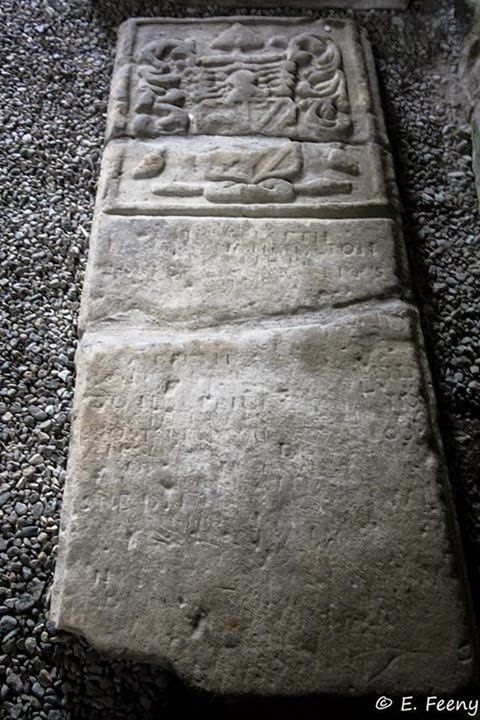 Still being on some form of natural high from my visit to Dungiven, the Priory was the first thing I told him to go see, but I added the warning about parking that I mentioned above, along with the disappointment at not being able to get as close as I’d have killed to the O’Cahan tomb. I could hear the chuckle in his reply when he said that he’d visited the site on a previous trip and had even gotten inside the chancel in the company of a guide. With no small hesitation, I mentioned that I was (eventually) hoping to do a blog post on the site and wondered if he’d taken any decent photographs of the tomb that I might be able to use. In an act of huge generosity, he has given me permission to reproduce a selection of his excellent images. I thought they were so lovely, they should have their own blog post (here)! As always, I hope that readers of this blog enjoy the photos, and that they act as a little inspiration to come see Northern Ireland in person and sample some of these wonderful sites! NI Sites & Monuments Record contains some original excavation drawings, finds illustrations, etc. Boyle, E. M. F.-G. 1903 The castle and bawn of Dungiven. Ulster Journal of Archaeology 9, 2nd Series, 127-130. Brannon, N. F. 1988 ‘A lost 17th-century house recovered: Dungiven, Co. Londonderry’ in Hamlin, A. & Lynn, C. Pieces of the past: archaeological excavations by the Department of the Environment for Northern Ireland 1970 -1986. Belfast, 81-84. Brannon, N. F. & Blades, B. S. 1980 ‘Dungiven Bawn re-edified’ Ulster Journal of Archaeology 43, 3rd Series, 91-96. Davies, O. 1939 ‘Dungiven Priory’ Ulster Journal of Archaeology 2.2, 3rd Series, 271-287. 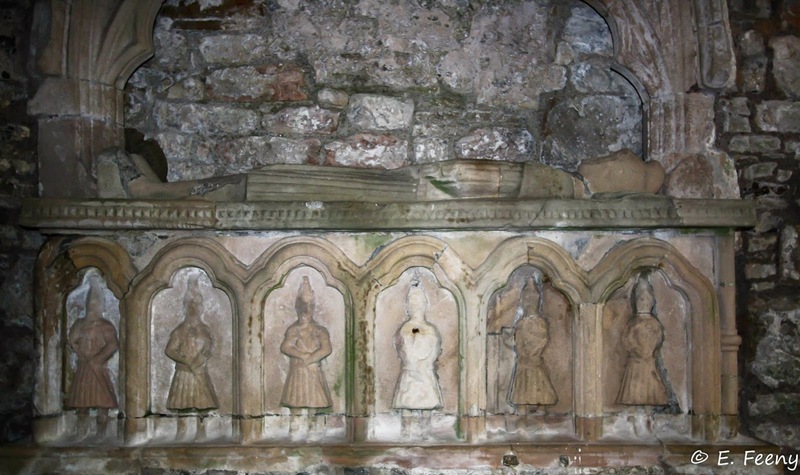 As I mention in the main post, these rather excellent photos of the O’Cahan tomb (and other items within the chancel area) were taken by Ed Feeny and used with permission. Once again, I’ve been out combining my love of archaeology with 3D (anaglyph) photography – and these are the, somewhat variable, experimental results. 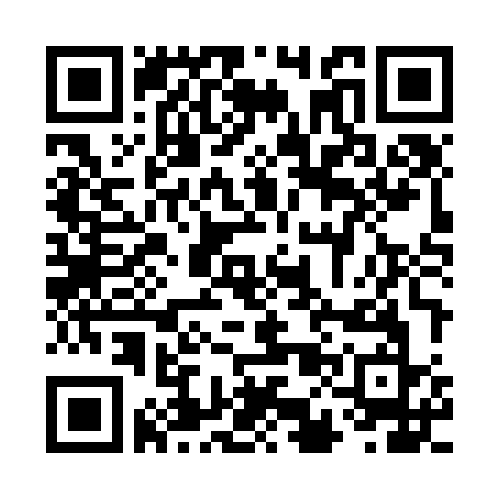 Information on glasses and other 3D images in this blog may be found here. Click for larger images. For this project, I wanted to see how I could use the mapping functionality within Tableau to visualise the battle sites and casualties of World War I. As my primary data source, I’ve used the Wikipedia article List of military engagements of World War I, and references therein. The article is quite good, and provides a structured list of Fronts, Theatres, and Campaigns, with individual battles and actions listed within these sections. I wanted to see if I could extract the baseline data from the text and reconfigure it into a more visual entity, with a degree of interactivity that would allow the user to create their own visualisations, based on all or subsets of the data. Within each action, I have gone to the appropriate Wikipedia Page and extracted the following information: Front/Campaign; Action; date (start & end); the location (converted to decimal Latitude and Longitude); the belligerents by primary grouping (Entente or Central Powers); human strength in the field (excluding ordnance, shipping, and aviation) where available; Casualties/Losses where available; POWs where available; the victor; along with a link to the Wiki article. I’ve also captured notes on strength and losses to add detail as a hover-over tool tip on the maps. Below, I provide a more detailed set of notes on how I used the data and the decisions I had to make to get it into a useable format. The chief point I would make here is that I’m no expert on World War I, so this has been a learning experience for me as much as anything else. Like many non-specialists, my primary knowledge of the war centres on the Western Front and, as I live in Northern Ireland, the participation of the 36th (Ulster) Division in such iconic actions as Messines, the Somme, and Passchendaele. Beyond that, my knowledge came mostly from cinema – Peter O’Toole as Lawrence of Arabia and Mel Gibson in Gallipoli. After that, it all got pretty hazy. So, for me, seeing the integration of the fronts and actions and how they all fitted into a greater whole was an eye-opening experience. I hope this visualisation will provoke similar opportunities for understanding and comprehension for others. It is for this reason that I have attempted to provide as many interactive filters as possible to better interact with the data. I've provided controls to drill down into the Front/Campaign, and select by date of action for either everyone involved or by the chief belligerent grouping. When brought down to the level of individual belligerents, hovering over a map point will display a 'tooltip', giving summary notes on the strength, casualties & losses, and POWs where they are known. Clicking on any data point on the 'Further Reading' tab will bring up the appropriate Wiki page from where I’ve drawn my information, and allow the user to (I hope) gain more detailed insights on individual actions, and the vast human cost of lives that conflict brings with it. The first dashboard (Overview) in the Tableau presentation is a set of four maps – influenced by the style of Dittmar’s arrangement of maps displaying the spread of the printing press. These maps show various aspects of World War I and are interlinked, so that changes to the filters that control one simultaneously change the others. The top left map simply gives a dot for each battle site. Top right shows the strengths known to have met in battle. Basically, the bigger the dot, the bigger the number of soldiers involved. Bottom left gives the known casualties, and the POWs are shown at the bottom right. In all cases the points are coloured by the victorious side and include categories for ‘stalemate’ and ‘inconclusive’. I wanted this dashboard to be as clean as possible, so I’ve removed the filters down to what I think is an absolute minimum – just the controls to select Belligerent, Front/Campaign, and Start Date. The remaining portion of the right-hand real-estate is taken up with a scrolling list of Actions that, based on the choices in the previous filters, expands and contracts to only show relevant values. I’ve removed all keys to the meaning of the colours and the sizes of the dots as I want this to be a high-level means of interacting with the data without extraneous distractions. 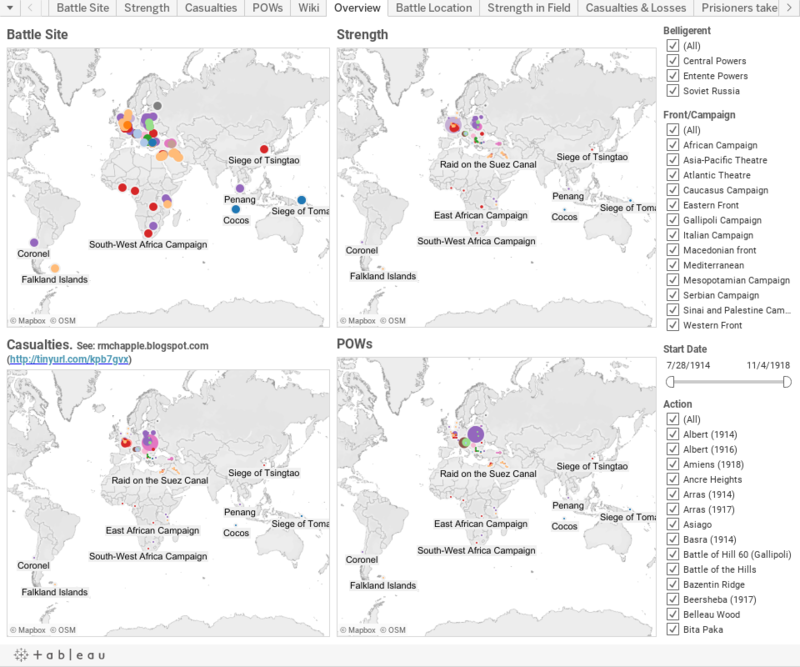 The following four dashboards (Battle site, Strength, Casualties, and POWs) take the same format - these are all accessed through tabs at the top of the visualisation, to the right of the Overview tab (to the left of the Overview tab are all my workbooks that were used to produce the Viz, but Tableau doesn't seem to allow me to show multiple Dashboard tabs without them, so just ignore them!). Based on the choices made on the Overview dashboard, the map here will adjust to these specifications. The filters for Belligerent, Start Date, and Action remain so more refined drill-downs into the data can be accomplished. To add context, I’ve included dynamic keys, where appropriate, to show the size bins represented by each dot and an explanation of the colour keys. However, for reasons of space, I have chosen to omit the Front/Campaign filter. My reasoning is that anyone coming to one of the secondary dashboards has already made significant choices in what data to view. If you’re looking to see that piece of the map, I reckon you’ll want to drill further down into the data, not shift radically to another part of the globe. Even if you do want to, all that is required is to go back to the Overview dashboard and reset your choices there. A final tab lists Further Reading and provides a list of the individual Actions, the Front/Campaign, a short URL to the relevant Wiki page, along with a small visual indicator as to which year the action took place. Clicking on any of these will bring up the relevant Wiki page in a new browser tab. This, too, is filterable by Front/Campaign, Start Date, and Action, and the filters dynamically react to previous choices. I’ve spent quite a bit of time collecting the data and designing the dashboards, so I’m justifiably reluctant to discuss potential deficiencies. Nonetheless, it’s important to address certain issues. As previously stated, my chief deficiency that I bring to this project is that I’m no WWI scholar. I’ve relied exclusively on the information available within Wikipedia and, by extension, the trustworthiness of that information. While any perusal of the individual entries shows how variable the level of detail is regarding the numbers of combatants and casualties etc., it has been more difficult to assess the actions I’ve missed and neglected to include in the dataset (my ‘unknownunknowns’). For example, my primary list notes the Second Battle of Dover Strait (1917) but fails to include the First Battle from the previous year. In reading about the 36th (Ulster) Division, I realized that the Battles of Haelen (1914) and Courtrai were missing. These have all been added in, but I’ve still no real idea of what I’m missing. I suspect that, while I’ve got most of the broad strokes, there are significant lacunae. As it stands, my data accounts for 12,980,970 casualties and 2,394,171 POWs, far short of the estimated 37,000,000 dead and injured. If anyone wants to develop this as a more accurate resource, I’m happy to turn over my data and give advice I can, but I don’t foresee myself undertaking any large-scale research project to expand the dataset. The other major deficiency in this visualisation is down to my inability to plot duration of action. If you’re looking at the all or parts of the data set for the entire course of the war – from August 1914 to November 1918 – everything looks fine. It’s only when you attempt to use the double ended slider for fine-grained analysis that issues occur. While I have recorded beginning and end dates for all entries, only the beginning dates will appear on the map. For example, although the East African Campaign lasted for the entirety of the conflict, it will only appear on the map when the slider is set to include August 1914. I have tried unsuccessfully to remedy this, but without success. In the absence of a technical solution, I can only suggest that you use the time slider with caution! I’ve taken the decision to create two entries for each action. One lists the strengths, losses, etc. for the Entente Powers, and the other for the Central Powers. This was done for convenience and doesn't generally cause any issues, except where the user is looking for details in the hover-over Tooltips. In this case, Tableau sees that there are two different pieces of data to display and defaults to an asterisk (*). This can be resolved by selecting only one of the belligerents at a time and viewing the notes individually. Where there are a range of possibilities listed, say, the numbers of recorded casualties, I have in all cases gone for the lower number. Where the numbers are given as Divisions, I have used the minimum number of 10,000 soldiers, except for American Divisions that were commonly of 20,000 men. Similarly, a Brigade is given as one third of Division, so I’ve chosen the round figure of 3000. In the absence of other data, I’ve taken the minimum number of two Divisions in a Corps, 300 soldiers in a Battalion; and 1000 in a Regiment. However, in many cases there is simply no real idea of how many soldiers were engaged in the action and while I lament the lack of data, I’ve not attempted to speculate. In some instances, like the Battle of Le Cateau, there are losses listed, but no figures are given for strength. Here, I’ve simply reasoned that there must have been at least as many troops as casualties. Thus, if there are 5000 casualties listed, I’ve merely given the strength as the same. With regard to casualties, my original plan had been to list out dead, wounded, and POWs as separate data fields. Unfortunately, the way the data is recorded is relatively variable, so I’ve been forced to lump the dead and injured together as a single category, taking the POW numbers where they are occasionally available. Some large actions are composed of a number of smaller actions and have been broken down into these constituent parts. For example, the Battle of the Frontiers has been deconstructed into a series of smaller battles at Mulhouse, Haelen, Lorraine, the Ardennes, Charleroi, and Mons. The Somme offensive was composed of numerous smaller engagements (First day on the Somme; Albert; Bazentin Ridge; Fromelles; Delville Wood; Pozières; Guillemont; Ginchy; Flers–Courcelette; Morval; Le Transloy; Thiepval Ridge; Ancre Heights; The Ancre) and each is mapped separately. Similarly, the Monastir Offensive in the Macedonian Front is broken into its constituent actions at: Malka Nidzhe, Kaymakchalan, and Crna Bend (1916). The Vardar Offensive is divided into its two main actions at the Battles of Dobro Pole and Doiran (1918). By the same token, the Battle of the Lys was composed of several smaller actions (Battles at Estaires, Messines, Hazebrouck, Bailleul, Kemmel, Béthune, and the Scherpenberg), but do not receive individual attention within Wikipedia, so they have been graphed as a single entity. The Battle of Mulhouse had two distinct periods of action (7–10 August 1914 & 14–26 August 1914) but is recorded as a single event with one start date (7 August) and one finish date (26 August). Similarly, the Second Battle of the Aisne has two periods of action (16 April – 9 May, 24–26 October 1917), but is mapped as a single entity. Some events, though they involved large numbers of people and resulted in significant loss of life, are more difficult to map. For example, the Russian Great Retreat took place across Galicia and Poland, but I’ve merely located it on the San River where some of the action took place. The October Revolution, while not a conventional action (i.e. two forces facing each other across a battlefield), was nonetheless an important event with serious repercussions for the outcome of the war. For this reason, I’ve included it. Operation Faustschlag, an initiative to capitalize on the Russian withdrawal after the October Revolution was a complex and fast-moving series of events where German and Austro-Hungarian forces advanced to within 100 miles of Petrograd. Rather than attempting to map the breadth of this action, I’ve taken the simple expedient of plotting the activities as a single point at Brest, Belarus, where the treaty ending Russian participation in the war was signed. Similarly, the Morava Offensive in the Serbian Campaign was carried out along a front from Leskovac to Negotin, though I’ve only chosen to map the former point. Again, the Ovče Pole Offensive was fought along a front between Vranje, Serbia and Berovo, Macedonia. Once again, for convenience, I’ve simply plotted the action at the former city. The East African Campaign was fought over portions of Modern Tanzania, Zambia, Mozambique, Rwanda, Burundi, Kenya, Uganda, and DR Congo. As a compromise between attempting to detail all individual actions (which I neither have the time, knowledge, patience, or desire to do) and leaving it off the map, I’ve simply gone for placing a dot in the southern portion of, what is today, DR Congo, in the approximate centre of the conflict zone. For the sake of completeness, I’ve included the Pursuit of Goeben and Breslau as a single dot off the coast of Istanbul where they ended up, rather than attempting to plot the path they and the Royal Navy took through the Mediterranean. Despite the breadth of data available in Wikipedia, it comes down to the fact that it just doesn’t cover everything. For example, there is no entry for the Fall of Damascus in the Sinai and Palestine Campaign. This is particularly pronounced in the Mesopotamian Campaign, where no pages exist for several actions of various sizes (The Captures of Amara and Tikrit, along with the Battles of Nasiriyeh, Khanaqin, Jebel Hamlin, and Istabulat). In such cases, I’ve been forced to omit them from the dataset. The single most difficult category of data to deal with has been the naval engagements. By their nature, they can be relatively wide-ranging. As discussed above, I’ve had to make decisions about how and where they appear on the maps. Beyond that, the chief difficulty has been that the human level data is frequently missing from the Wikipedia articles. Numbers and types of ships are most commonly given in ‘Strength’ and ‘Casualties and losses’ data, but in the majority of instances, there is little account of the numbers of sailors who partook and perished in these encounters. The title of this post is based on Rupert Brooke’s 1914 poem ‘The Soldier’. However, if I’m to be honest, I encountered his work not through any particular love of poetry, but through early exposure to the music of Pink Floyd, specifically their underrated 1983 masterpiece The Final Cut. Listen to it for free: here.